Two years have gone by since I first laid eyes on the aurora borealis. 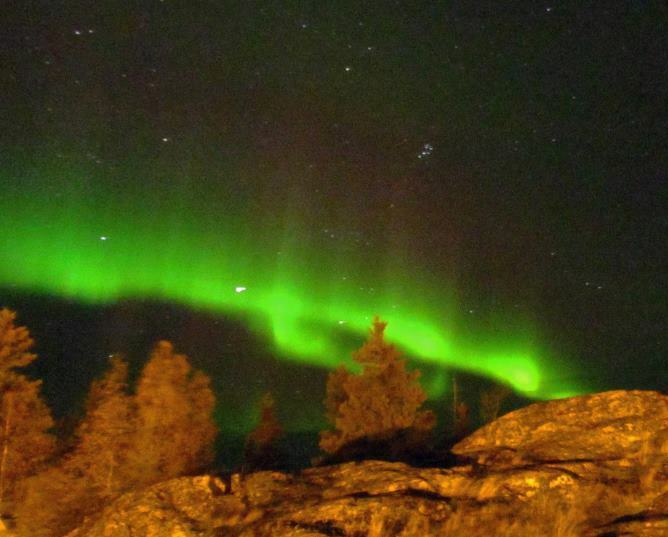 At the time, I was one of numerous tourists who make the pilgrimage to Yellowknife. Since then I’ve seen them countless times, and I can never be bored with them. 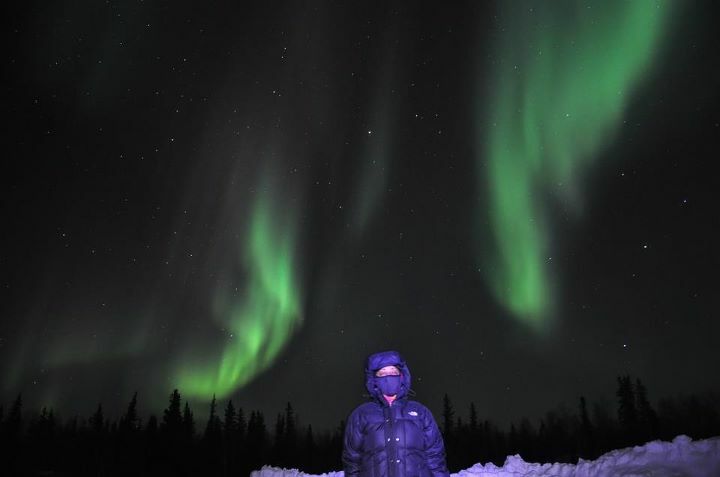 If you’re wondering where to see northern lights, Yellowknife bills itself as the aurora viewing capital of North America, so it’s a tourist haven. 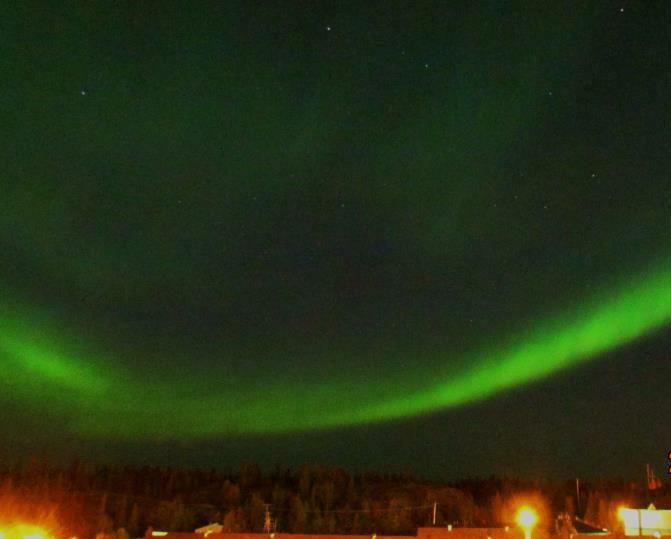 There is even a web site where you can check the forecast for the northern lights tonight. One of the things that’s intriguing about living in Yellowknife is how the fascinating can be so ordinary. On some clear nights when I’ve been downtown, I have looked up and seen the aurora borealis, despite all the city lights. It is wondrous to me that there is something dancing in the sky, yet people who have lived here for a long time don’t even look up. I am the equivalent of the person who has never seen the sea, who takes up residence on an island. Something as mundane as going outside to put out the garbage can take me a long time, because sometimes I see the northern lights directly overhead, so I stay out for a while. I’ve heard it said that you can call the aurora borealis to you by whistling, but I haven’t tried it. Given that it’s 100km away, I suspect that my whistling might be in vain. What I do know is that it has a presence, which must be felt to be understood. Sometimes it hovers overhead with a tail, like a genie that has escaped from a bottle, at other times it’s a narrow streak across the sky, and on occasion it presents as a magnificent shimmering stage curtain in the distance. Its forms are endless, and its energy is always beneficent. I’m told that the colder the temperature, the better the aurora. That was certainly the case the first time that I trekked to Yellowknife and witnessed a spectacular show in the sky, on a bitterly cold night. Despite all of the subsequent viewings, that first time was the most dazzling, and it remains seared into my memory. This is my account of that trip. 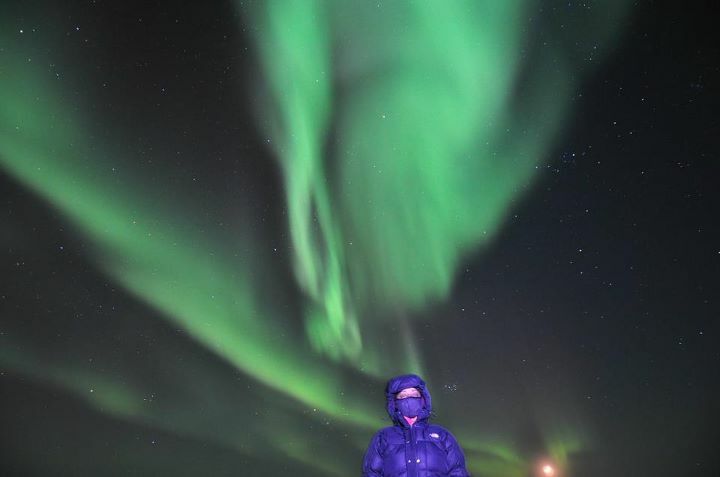 It all began in the month of December, when a friend showed me photos of the aurora borealis over Yellowknife, and encouraged me to experience the unique appeal of this northern capital city. I had recently returned to Toronto after spending Christmas in Trinidad & Tobago, and I was resolved to do some things out of the ordinary in the next year. Travelling into the inhospitable winter of 62° north of the Equator certainly wasn’t something that I’d ordinarily do, especially having just left the life-sustaining warmth of 10° north. Back then I lived in Toronto, the alleged centre of the universe, where “up north” was mentioned with a dismissive wave of the hand, as if it were a galaxy far away. Since I’d never been up north, early in the New Year, I made the decision to explore the far-away galaxy. In preparation, I bought a balaclava, extreme weather thermal clothing, and boots guaranteed for warmth at sub-zero temperatures. They were also guaranteed to be the most ferociously ugly, clumsy footwear I would ever own, although, to my amusement, the salesperson thought that my choice was “the fashionable version”. When I tried on the balaclava I looked like a bank robber, but in those ungainly boots, I’d never make it to the getaway car. The day arrived and the journey from Toronto commenced rather inauspiciously. A late flight departure resulted in missing the airline’s sole connecting flight, turning the 7-hour trip into a 16-hour endurance test. Luckily, there were other passengers in the same predicament. So after some eight hours in the Edmonton airport, I acquired two new friends, secured a dog-sledding partner, and managed to arrive in Yellowknife that night. As the plane approached the city, I scanned the dark skies for anything like what I’d seen in the pictures, but was disappointed to find them as unexciting as the skies in Toronto. The next day, my first stop was the Visitors Centre, where I armed myself with a tourist map and some advice from the staff. I then set off to explore the city on foot. During my first 2 days, I browsed the exhibits at the Prince of Wales Northern Heritage Centre, toured the beautifully symbolic Legislative Assembly building, and walked around the quirky Old Town. The city was intimate, enchanting, politically remarkable and historically fascinating. However, my quest was for the aurora borealis. On the first two nights it evaded me, as the sky was cloudy. Truth be told, I fell asleep waiting up on the second night. For my third night, I decided to take one of those northern lights tours, which were done north of the city, to escape the clouds and light pollution. I was fortunate to be referred to Joe, a tour guide of the Dene First Nation, and I made arrangements in no time. Around 11pm, he picked us up from various locations – a group of six in all – in a big SUV. We drove about 20km out of the city, along the Ingraham Trail, to the frozen Prosperous Lake. We stood on the frozen lake in the cold, staring at the sky for some time. The temperature was at least -34°C, and with the wind chill it was about -45°C. Silly me, I had the absurd idea that the northern lights would grace the sky all night, but I learned that it was a waiting game. Nothing appeared, so we drove some 10km farther, to Prelude Lake, another frozen expanse, where a bitter wind howled freely, making the place as cold as Hell. My days of Catholic school are long behind me, and I’m now wise enough to know that all that talk about the fires of Hell was utter nonsense. There is absolutely no doubt in my mind that any hell absolutely must be a freezing cold place. As we waited and watched the sky, some faint, milky streaks eventually began to form, like clouds stretched into the shape of a broad jet-stream. Joe informed us that the aurora borealis moves from east to west, so if we were ever to get lost, we could ascertain our direction by it. That was good to learn, but by no stretch of the imagination was I planning to wander off and get lost out there. The streaks moved around, sometimes in parallel, at times forking into each other, yet still faint and white, not particularly captivating, nor vaguely akin to the supernatural green shapes that I’d seen in the photos. They didn’t show up on my camera, which began behaving erratically in the cold, issuing low battery warnings and shutting itself off, despite having been fully charged. Whenever it humoured me and decided to work, my frozen fingers didn’t, so I soon abandoned all attempts to take any pictures. We were somewhat disheartened that not much was happening, but Joe maintained that the lights would brighten and with luck, they might even dance. He then warned us that unusually large wolf packs had been sighted recently and if any appeared, we were not to panic, but we should return to the vehicle, quietly, in an orderly fashion, and immediately. The aurora not co-operating, the temperature hellish, and now we had to worry about being eaten by wolves. Strange enough, the tourist guides had omitted even the vaguest hint of any of this. 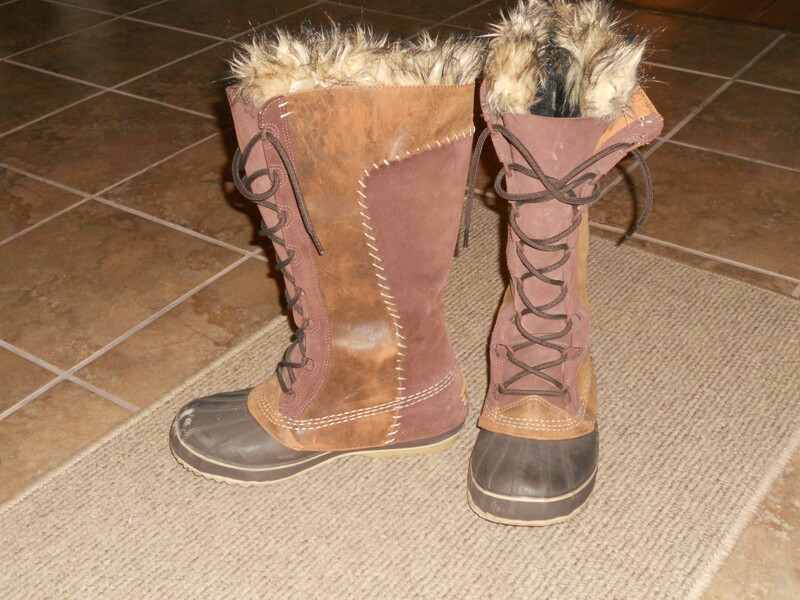 I had stuffed three layers of clothing under my goose-down coat, and I was wearing gloves inside my mittens, a hat and a hood, running tights and jeans, plus two pairs of socks inside my godawful, hideous boots. So although I did scan the surrounding area for any sign of man-eating creatures, I consoled myself that only sabre-toothed wolves could bite through my Michelin Man outfit, and I decided not to worry about it. Joe is very passionate about preserving the Dene culture. While we waited, he talked about the dying generation of elders and regaled us with tales of his childhood: that he used to lie in the snow to watch the aurora and that, when he misbehaved, his grandparents would threaten that the lights would swoop down to get him. Funny that regardless of the culture, it seems universal that children are threatened with bogey-men. Despite being warmly attired, my feet soon began to turn into blocks of ice, so every now and then, I was forced to return to the idling vehicle to warm up. Nothing much was happening in the sky anyway, so there was no sense risking frostbite. I wasn’t the only one hopping in and out, so I felt vindicated. By 1:30am the streaks had brightened a wee bit, which had raised our expectations, but then they had faded again, along with our hopes. Joe declared that we’d stay for a few minutes more, then we’d call it a night. Shortly, we filed dejectedly into the truck, but as Joe was folding up the last chair, he urged us to get out quickly, because the aurora was starting to dance. We scrambled back out and what an exquisite dance it was! The sky had turned from faint, white, horizontal streaks into wildly gyrating, intersecting, colliding figures of light green. They danced a swooping and swirling dance, rippled like the sea as the wind passes over it, circled and shimmied, formed funnels like tornadoes, rocketed into the heavens, dove back to the earth like meteors, and they danced the most breath-takingly beautiful dance, like an ethereal Tango that spoke to my soul. It was the most moving, awe-inspiring sight that I’d ever beheld. It was well worth every frosty minute of waiting, to witness this magical spirit in the sky, and to feel its soothing presence. I don’t know how long it lasted, but when the dance was over and the lights had faded, I had to remind myself to breathe. We remained transfixed in our tracks, continuing to stare at the heavens, not sure what to expect, speechless. Reluctantly, we wrenched our eyes away, slowly piled into the truck and headed back to town, in mesmerized silence. Two nights later, I dined at a popular restaurant in Old Town, and as is the custom, I found an inch of space and added my scribble to the other writings on the ceiling. Seemingly of its own volition, my hand wrote “I’ll be back”. Deep down, I suppose I already knew that I’d be returning to Yellowknife.